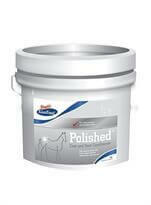 Pryde's Polished has been formulated to provide a simple and economical coat and hoof conditioner for all horses. Based on full fat soybean for quality amino acids and essential fatty acids to assist hoof growth and coat shine. Contains biotin, organic zinc and methionine for hoof growth, strength and quality. Includes organic copper and cold pressed canola oil with omega 3 and 6 fatty acids for a brilliant coat and healthy skin. Pryde's have formulated Pryde's Polished® to provide a balanced nutrient intake based on the knowledge of the specific needs of horses and the nutrient content of common feeds. Formulations are updated regularly as new research findings become available.